While our allotment of advance tickets has sold out online, please note than an additional batch of tickets will also be available to purchase at the door each day of the show, first come, first served. You should know the rules by now: Don’t expose them to bright light. Don’t get them wet. And above all, don’t feed them after midnight. So join Gizmo and all the other furry, monstrous Gremlins as they burst off the screen in the greatest small-town holiday adventure since It’s A Wonderful Life! 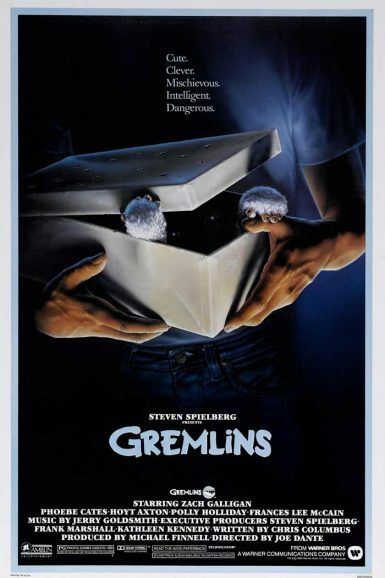 This bonanza of proliferating pests is the beloved result of the remarkable union between director Joe Dante, writer Chris Columbus, and Steven Spielberg’s Amblin Entertainment. Mixing Norman Rockwell sentimentality and anarchic vandalism, this Christmas-comedy-horror classic both lights up and destroys everything you love (and loathe) about the holidays. Check out the full set of Gremlins lobby cards on the New Beverly forum.